Why is farmland important for these species? There are approximately 60 species of dung beetle in the UK. They are not the ‘ball rollers’ seen in warmer countries and on TV, instead they live inside the dung pile (dwellers) or in the soil beneath it (tunnellers). Livestock grazing provides much of the dung required for the survival of these beetles, although other animals such deer and badgers also contribute. Some species are rather specialised and require exacting conditions. 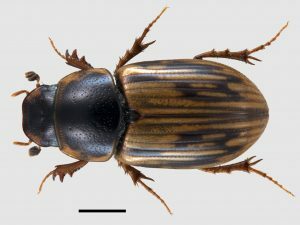 For example, Volinus sticticus prefers horse or sheep dung in the shade and Onthophagus joannae is a sun loving beetle that favours sheep dung on light soils. Others are less fussy and have few specific requirements. It is possible to find dung beetles at work all year round. Several species are winter active, although the vast majority are found in the spring, summer and autumn. 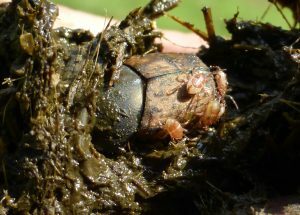 Given the right conditions, dung beetles can decimate a pile of horse poo or a cow pat in just a couple of days. How do dung beetles benefit farms? Dung beetles provide a wide range of ecosystem services that help to maintain healthy pastures and soils. These include the most obvious, the consumption of dung thereby removing it from the fields thus reducing pasture fouling, but also some that you may not have considered. 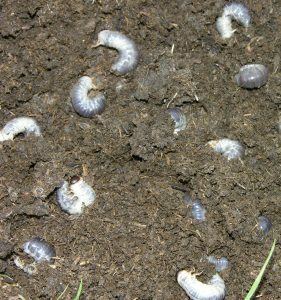 As the beetles tunnel down through the soil, burying the dung for breeding purposes, essential nutrients are recycled within the soil profile. This improves grass growth and provides a direct benefit to grazing animals. 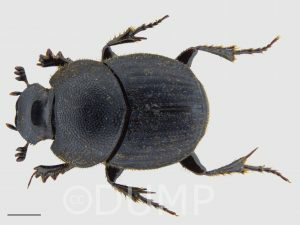 The larger species such as the Minotaur beetle (Typhaeus typhoeus) can tunnel a metre or more, this action breaks up the ground and improves drainage, especially useful on clay soils. In addition, dung beetles also reduce nuisance fly populations by transporting phoretic mites that eat fly eggs and help control intestinal parasites by reducing dung suitability for worm larvae. The beetles are also an important food source for many other farmland favourites such as bats and birds. Continuity of the dung supply and diversity of habitat are key factors in supporting a diverse range of dung beetle species on the farm. If possible, maintain some outdoor grazing year-round, even if only a few animals. Planting a group of trees and grazing within them will provide variety of forage and shelter for livestock and support the shade loving dung beetles too. Broad spectrum livestock wormers such as avermectin are detrimental to beneficial dung invertebrates. These chemicals are excreted in the dung for many weeks after treatment and a range of lethal and sub-lethal effects occur depending on the concentration. Such effects include slowing beetle larvae development, reducing the size attained at adulthood and reduced breeding capacity. Cutting down the use of chemicals on the farm with a sustainable worm control policy that includes monitoring with faecal egg counts will help. Treating animals only when necessary will save money and also slow the rate of anthelmintic resistance. As a natural alternative in a rotational system, consider using herbal leys. Sainfoin, birdsfoot trefoil and chicory all have anthelmintic properties. The latter has been shown to reduce worm burden in sheep by as much as 40%. In permanent grasslands, mixing up cattle and sheep grazing works by reducing the stocking density of the parasite host – cattle and sheep worms are different species. Supporting dung beetles on your farm not only helps keep pasture and livestock healthy, it also represents good economic sense. It has been estimated that dung beetles save the UK cattle industry £367 million per annum through the provision of ecosystem services (Beynon et al., 2015). So, it really does pay to look after these useful little creatures. For further information and dung beetle identification resources, please visit the Dung beetle UK Mapping Project website or get in touch via email or twitter. Why is farmland important for this species? Hedgehogs are found throughout the UK in all habitats. They have historically been associated with farmland for centuries. 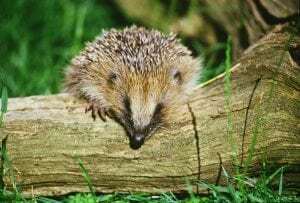 Hedgehogs are insectivores, foraging in fields and on grassland for worms, and along field margins and at the base of hedgerows for beetles, snails and other invertebrates. They are considered a generalist species, inhabiting most areas of our countryside, our villages and many areas of our towns too. However, as the dominant habitat in the UK, farmland is particularly important for hedgehogs. Hedgehogs, like all animals, need to feed, hide from predators and find mates. A variety of habitats that provide foraging areas and secure nesting sites is ideal. Both arable and pasture land can support healthy hedgehog populations. Wide, species-rich hedgerows with buffers of grassy margins on either side provide safe ‘highways’ for hedgehogs to move around the landscape. Hedgerows with wide bases that are managed on rotation should have healthy invertebrate populations for hedgehogs to feed on. Old hedges with dense root systems and lots of deciduous leaves are ideal for them to use as nesting sites, both during the summer and in winter as hibernation spots. The denser the network of hedges, the more securely hedgehogs can move around, and the higher the availability of prey species for them to feed on. Recently ploughed fields can provide a bounty of earthworms and other prey; hedgehogs can be found in-field taking the opportunity to feed on invertebrates once crops have been harvested. Recent studies show hedgehogs are found nearer to farm buildings. These areas could be providing safety from predators on farmland with less robust and fewer hedgerows, and larger fields. Increasing hedgerow availability provides more nesting and foraging areas for hedgehogs. Ensure that hedgerows are species-rich, contain native trees and are as wide, high and dense as possible. Maintaining hedge bases at least 2m wide with minimal or no gaps provides secure safe nesting sites. Managing hedgerows on a 3 year rotation ensures that hedges remain diverse and robust. Field margins provide buffer zones to protect hedgerow bases. 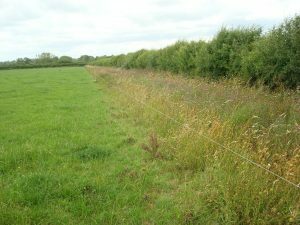 2m margins in arable fields and 3-6m margins in pasture ensures the hedges are protected from trampling and grazing, whilst the grassland provides extra invertebrate prey. Beetle banks also provide buffer zones and extra foraging areas. Smaller field sizes with a mixed crop provides greater variety, and therefore greater food security, for hedgehogs and other wildlife. Increasing hedges and field margins on farms with fewer, larger fields, provides habitat for hedgehogs. Reducing tillage or moving to no-till or conservation agriculture reduces soil compaction, increases soil invertebrates and improves and increases the depth and quality of the soil organic layer. Reducing pesticide and herbicide use means that more invertebrate prey, in particular earthworms, will be available on farmland for hedgehogs to feed on. The above management measures recommended to provide a healthy landscape for hedgehogs are typically those associated with traditional farming practices. There should be no problems, though many of the measures may be more time-consuming than those associated with farming on a larger scale. Peoples Trust for Endangered Species (PTES) and British Hedgehog Preservation Society (BHPS) have created an advice note detailing management and stewardship options that will benefit not only hedgehogs but other wildlife too (see link below). Creating and managing hedgerows sensitively has financial costs but there are stewardship options available; individual ones for the management regimes listed above are detailed in the attached advice note. Managing a farm for a species such as a hedgehog involves looking at the farm as a whole. Unlike species that fly, such as butterflies, hedgehogs needs the entire landscape to be suitable in order to thrive. 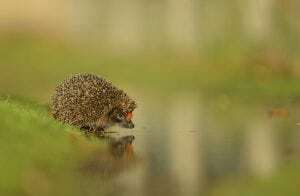 Consequently, many of the management techniques recommended to improve habitats for hedgehogs will also provide a healthier landscape. A denser proportion of hedges and associated smaller field sizes both help to reduce soil erosion. Reducing tillage improves soil organic matter and reduces soil compaction. Do we really need to feed the birds?